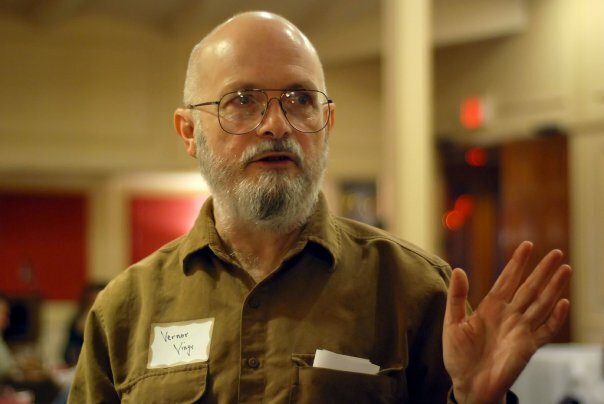 John Moravec of Education Futures interviewed mathematician and science-fiction writer Vernor Vinge, noted for his foundational 1993 essay, “The Coming Technological Singularity. “I’m still where I was in my 1993 essay that I gave at a NASA meeting, and that is that I define the Technological Singularity as being our developing, through technology, superhuman intelligence — or becoming, ourselves, superhuman intelligent through technology,” said Vinge. The networked sum of all the embedded microprocessors in all our devices becomes a kind of digital Gaia. That qualifies, as an ensemble, as a superhuman entity. That is probably the weirdest of all possibilities because, if anything, it looks like animism. And, sometimes I point to it when I want to make the issue that this can be very strange. I think that actually the networking of embedded microprocessors is going like gangbusters. The network that is the Internet plus humanity, that is also going with extraordinarily surprises, if you just look at the successes in the various schemes that go by names like crowdsourcing. To me, those have been astounding, and should give people real pause with how to use the intellectual resources actually that we have out there. So far, we do not have a single computer that is really of human-level intelligence, and I think that is going to happen. But, it is a kind of an amazing thing that we have an installed base of seven billion of these devices out there. When dealing with unknown futures, it remains unknown how to prepare people best for these futures. He states that the best pathway involves teaching children “to learn how to learn” (a key theme in Fast Times at Fairmont High) is the best way we can encourage the development of positive futures is to attend to diversity in our learning systems. We need to not facilitate the formation of diverse students, but we also need to abandon a monoculture approach to education and attend to a diverse ecology of options in teaching and evaluation.